For your safety, the Dual clutch transmission has a shift lock system which prevents shifting the transaxle from P (Park) or N (Neutral) into R (Reverse) unless the brake pedal is depressed. 1. Depress and hold the brake pedal. 2. Start the engine or turn the ignition switch to the ON position. 3. Move the shift lever. If the brake pedal is repeatedly depressed and released with the shift lever in the P (Park) position, a chattering noise near the shift lever may be heard. This is a normal condition. Always fully depress the brake pedal before and while shifting out of the P (Park) position into another position to avoid inadvertent motion of the vehicle which could injure persons in or around the car. 1. Press the shift-lock release button. 2. Move the shift lever. 3.We recommend that the system be inspected by an authorized Kia dealer. 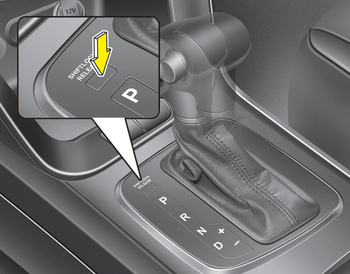 The ignition key cannot be removed unless the shift lever is in the P (Park) position.